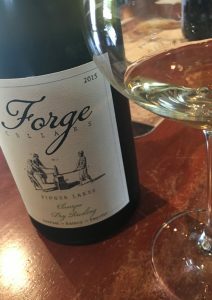 2015 Forge Cellars, Dry Riesling Classique, Finger Lakes, New York. The Finger Lakes outpost of Rhone legend Louis Barruol, famed Gigondas producer, Forge Cellars is a new project focused on dry Riesling from vineyards around mostly Seneca and Cayuga lakes, with a mix of shale, gravely loam and clay with some limestone which gives the Finger Lakes it’s character and terroir influences. Along with his local partners Richard Rainey and Justin Boyette, Barruol’s Forge Cellars crafts limited release Riesling single site offerings as well as this 1,800 case production regional dry Riesling Classique cuvee with 85% from Seneca Lake and 15% from Cayuga Lake, which has only .4% RS and is as trocken as it gets! There is a lot of excitement about Finger Lakes Riesling, not only Barruol is jumping in here, with Paul Hobbs and Johannes Selbach (Selbach-Oster) also joining in here too, along with local hotshots like Ravines, Hermann J. Wiemer, Boundary Breaks and Dr. Konstantin Frank all which make wonderful wines. The Forge Cellars 2015 Dry Riesling Classique starts with an intense youthful expression of mouth waveringly dry and brisk fruit, a light petrol note, white roses and zesty citrus along with delicate layers of green apple, liquid shale, pithy peach pit, lemon oil, almond, marzipan, lime peel and verbena. It has a dusty dry mouth feel and tangy acidity that almost reminds me a bit of some Australian Rieslings like Gosset, Rolf Binder and Pewsey Vale, but with a smoky mineral and austere wet rock core and at 13% it does have a subtle density and gains a textural presence in the glass with air. I can’t wait to try the Cru offerings and will no questions enjoy more bottles of this one, it has a serve impact, but really grows on you and it will be a lovely Summer wine and great with a variety of cuisine, it’s a great value to enjoy now. 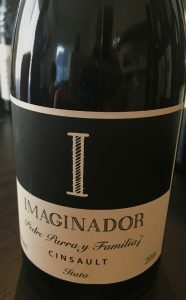 2016 Pedro Parra y Familia, Cinsault “Imaginador” Itata, Chile. Pedro Parra is one of the world’s most sought after terroir specialists, literally he is Doctor Dirt, with a Ph.D on the subject, and with a masters in precision agriculture, he consults all over the globe and is currently working with some of France’s top winemakers as well as crafting his own naturally styled wines from his native Chile. The Concepcion born and raised Parra makes his wines from ancient vines in the Itata region, Chile’s first viticultural area established back in the 1,500’s when the Spanish missionaries arrived here and planted vineyards, mostly Pais (Listan Prieto) aka the Mission Grape, the 200 million-year-old Batholith terroir is home to 200 to 300 year old still producing vines, some of the oldest on the planet, and the granite soils give a striking mineral presence, with the cool costal breezes helping extend the growing season to add complexity and natural acidity. Along with the Mission Grape there is old vine Carignan, Muscat, Palomino and Cinsault, and like South Africa the Cinsault takes on a unique and complete character allowing for impressive solo efforts from this varietal which usually is a blending grape in it’s home regions of Provence and the Rhone where it is considered a bit too simple to go it alone in most cases, while Parra’s version is impressively expressive and deep. I’ve become a huge fan of Parra’s wines and especially enthusiastic about this Cinsault and this 2016 is my favorite to date, with it’s vibrancy and purity it really thrills in the glass, less raw and funky than the prior examples it delivers a wonderful performance with each sip getting better than the last, it shows a bright intensity and stylish charm that is beautiful in bouquet, medium bodied and with ripe fruit on the textured palate. It starts with vivid and lush cherry, dusty floral tones, flinty spices and light cedary notes before gaining a darker sense with plum and forest berry fruits coming through along with wild lavender, minty fennel and candied citrus that adds complexity and live to this lovely garnet/ruby Cinsault. A touch more mineral freshness, fuller fruit and with a bit more width than a southern Rhone version this Parra example manages a deep expression of place and leaves a thoughtful impression, it’s makes for an exceptional hand made wine, especially for the price, drink over the next 3 to 5 years.